No, please keep it public, other people have an interest too. Too bad KM74-goanna doesn't has its own topic, so it's now shattered across various others, very disorganised. 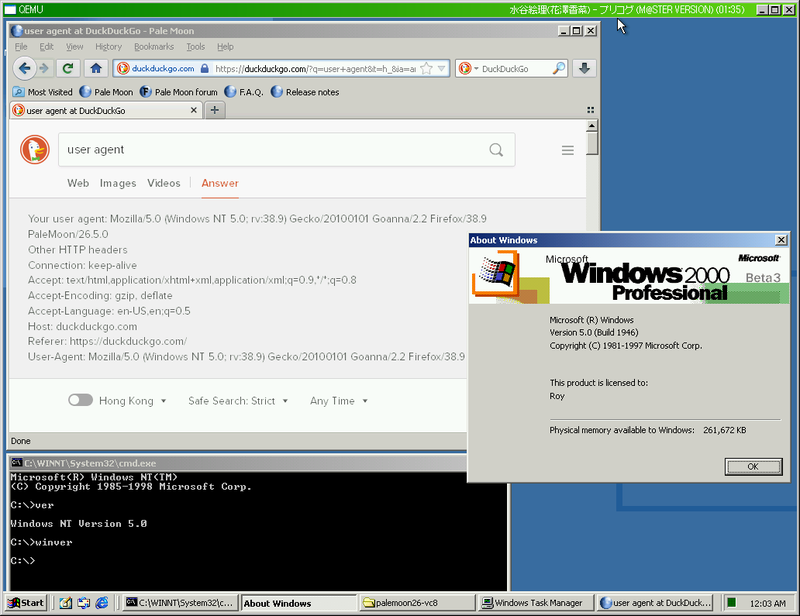 Well, it is better to discuss in that topic for questions about windows 98 since this one is not the right section. You have to install first the kernelex 4.5.2 and then replace the files. It's an update. From now, send me a PM if you need help because this is the topic of windows 2000.
i'll pm you after this one last post if necessary as i needed to clarify one thing, there is no need for me to first install kernelex 4.5.2 ( main program with older files ) and replace the files with the one you mentioned, i just checked right now in the kernelex folder in the windows folder and it already has all the updates files listed in that separate update you listed, the difference being that they all become installed automatically without needing to manually do anything if using the ""KernelEx 4.5.2016.17" package which as indicated before is the full kernelex program with latest updates already included in it. i can only confirm on these things, i have not tested actual functionality, i probably would need a different system or do a complete re-install of 98SE, possibly with ACPI disabled, without derailing too much from the post as it is indeed mainly for windows 2000, i will stop here and post further comments on the 98SE thread on backporting newer web browsers to 9x with kernelex, so please, if anyone has any updates to any of these related stuff, please post them there if using 9x systems. i was wondering how that most recent updated test binary of k-meleon 74 you listed compares with firefox 31.8.0 esr, more specfically for youtube as another forum member posted saying youtube worked on that k-meleon 74 version you listed but on windows me? 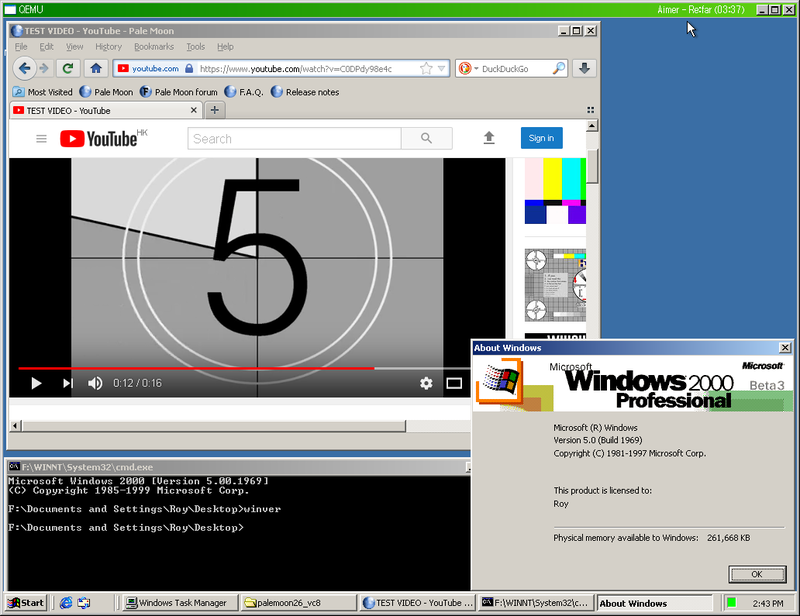 i noticed just recently that apparently not all videos will play on windows 2000 with the extended kernel using firefox 31.8.0 esr, it mentions a html5 related error, i only tried two videos, one displayed the error message and the other didn't and played fine. i was wondering if that k-meleon browser would work on windows 98SE with kernelex? it would be nice to use that k-meleon browser on windows 2000 if it doesn't require the extended kernel, that way, one can substitute the extra space for other official updates such as in my case of having all contents a bit less than 670 MB after burning on a cd, i realized the only program i only really needed more modern from the extended kernel for windows 2000 was the web browser firefox 31.8.0 esr, i don't think i needed anything else per say. Cool, but it's "normal" since they are close to the final version. actually 226 "builds" make huge difference, but yes, beta 3 is close to final version, and palemoon itself requires helper functions from IE5, which makes it not working in earlier builds of win2000. Do You know where i can download the latest version of kernel ex for windows 2000? I am having trouble locating the files on blackwingcat site because it's all Japanese!! The site is indeed all Japanese, but the filenames are not . Windows 2000 will be 19 years old this year on February 17. Regardless, many recent software that I've been testing still works well provided you have UURollup, KernelEx or some other platform update installed. BUFKIT, software that manipulates soundings from NOAA's weather model guidance runs on Windows 2000 as of the new version 19. I've only tested it with the extended kernel but it relies on VC++ 7.1 and VB6 runtimes so it will probably work with vanilla SP4. As for programs working on the extended kernel (v2.9bG), I've had success with the Serif "Plus" series all the way up to its discontinuation around 2015. Adobe Photoshop CS4 and 5 extended (CS3 is a little unstable) also work. I tried Illustrator CS6 but it crashes after loading plugins.